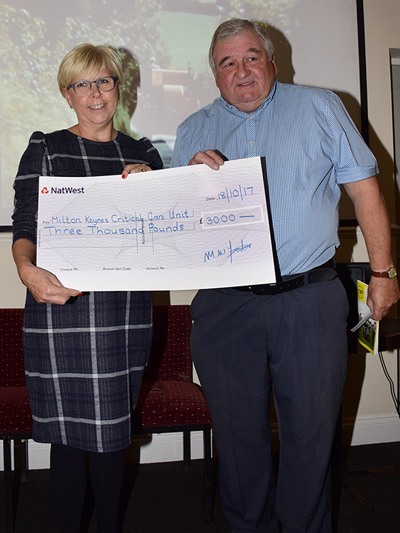 The NBVTC certainly did excel itself at this year’s AGM when the largest amount ever to be handed to a single charity was presented. Milton Keynes Hospital Critical Care has been one of our charities since the club beginnings, the charity was chosen in memory of our club founder and first vice chairman Lenny Wray. Lenny sadly passed away in 2006 and he had been treated at the hospital’s Critical Care unit. To receive a cheque for £3,000 on behalf of Milton Keynes hospital was Jo Peskett. Jo has been coming to receive contributions since the charity became one of our chosen recipients and this year she is retiring. The amount was largely increased thanks to the lads who did such a fantastic job collecting at Silverstone this year. (The tractors and passenger trailers were ferrying people around the circuit!). Other charities to benefit this year were the Brain Tumour Charity when we raised £350 at the Michael Cook ploughing match and Willen Hospice when £230 was raised at the Chris Singer ploughing match.